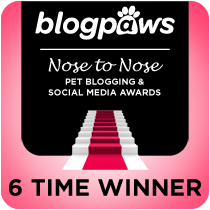 GLOGIRLY: Trapacat Tussle In The Townhouse & GIVEAWAY! WAFFLES: Hey Boss! Wanna go a few rounds in my new Trapacat? 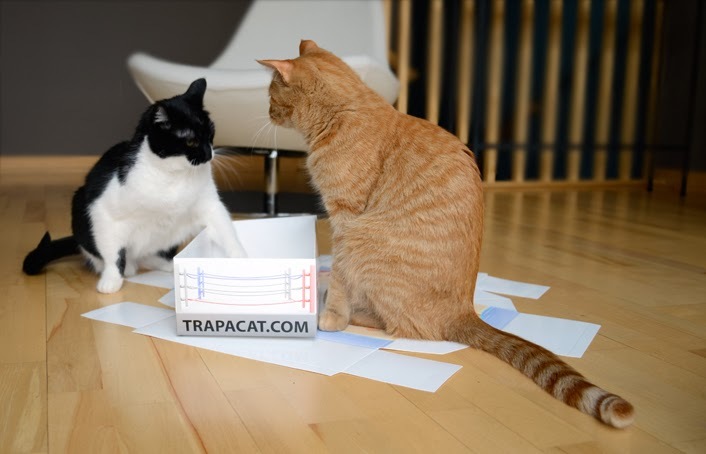 KATIE: Trapacat? This is a trap, right? WAFFLES: No, seriouslies. It's a BOX! You know, for playing and stuff. KATIE: It's the *and stuff* that worries me. WAFFLES: Look Boss, it's super simple. 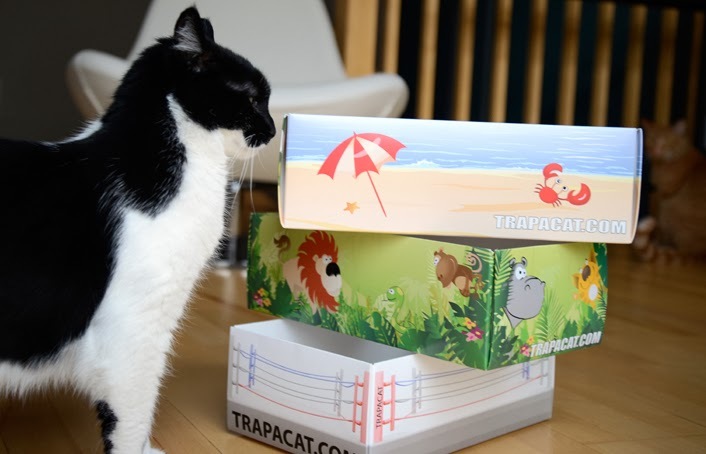 The Trapacat box comes flat like this, with the cool design already drawn on it. Then we just get Glogirly to fold it together. I saw her do it and there weren't even any HBO words. WAFFLES: They're also super-fun to play with BEFORE you fold them together! There's flaps to hide behind and punch with your paws. And they're like a slip-n-slide on the hardwood floors ...without the water. KATIE: We got THREE box traps? WAFFLES: Not box traps! Trapacats! A beach one, a jungle one and a boxing ring one. 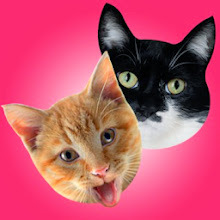 And the nice people that gave us our Trapacats are giving THREE lucky GLOGIRLY readers a Trapacat of their very own! WAFFLES: C'mon, Boss! Let's play! KATIE: Waffles, the only way I'm going to play with you is if Gloman referees. KATIE: This is SO not what I had in mind. Step 1 - Set Trapacat Down anywhere in your home. Step 3 - There's a CAT in your Trapacat! New designs & sizes coming soon! 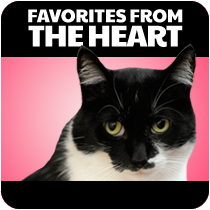 Three lucky GLOGIRLY readers will receive one Trapacat of their choice. 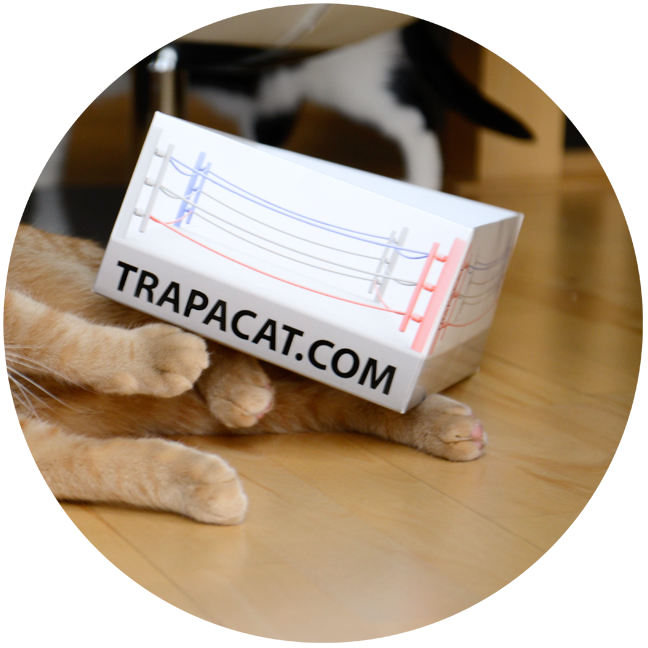 Shipping is only available to US & Canada, however overseas readers can gift their Trapacat to a friend or shelter. 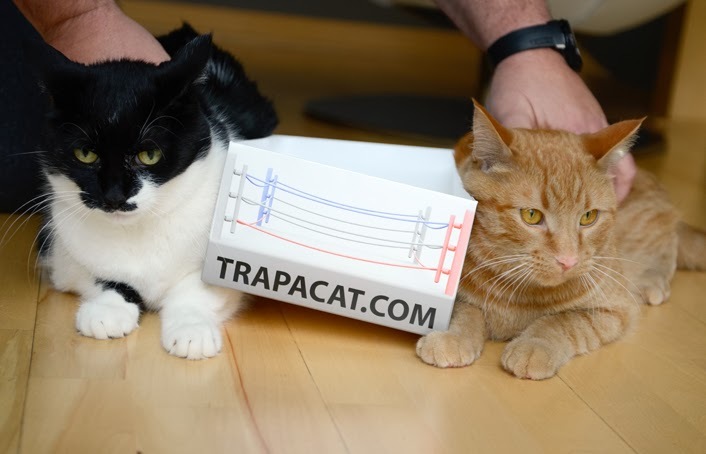 Just leave us a comment telling us which Trapacat is your fave. Make super-triple-sure we have your email! Share this giveaway with your friends on Facebook or Twitter. Just leave us a separate comment telling us. Giveaway is open to US and Canada residents only. 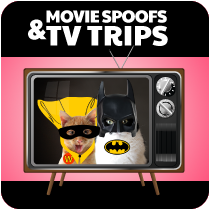 Overseas readers may enter and gift their prize to a US/Canada friend or shelter. No purchase necessary. Void where prohibited. Winners will be randomly selected using Random.org and notified via e-mail. Winners must provide GLOGIRLY with a physical address to which the prize will be mailed within 48 hours. If this information is not received, an alternate winner will be chosen by random drawing. Winners will be announced in a separate post following the drawing. 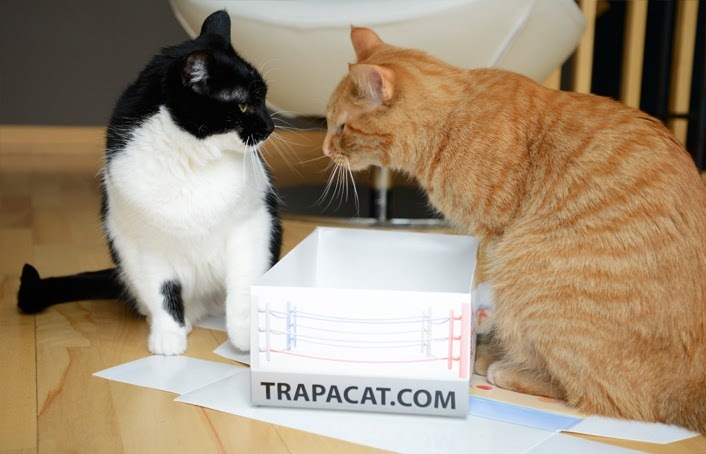 FTC Disclosure: We received this product for review at no charge from Trapacat. 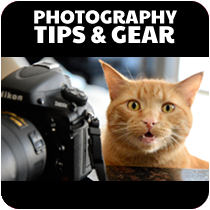 We also received a small fee to cover the time it takes to test, take photos, and write the review. Receiving the free product and the fee did not influence our review. All reviews on GLOGIRLY will always reflect our honest and unbiased opinions. Waffles - you aren't planning to trap Katie and erm, send her somewhere are you? We love these...especially the jungle print :) Sign Truffles up! Odin says he's never met a box he didn't like. This concept is crazy simple, but great! Have a great Thursday, furriends. Pee Ess - Mommy carries her Glogirly/Katie tote everywhere! She still loves it! Mommy is giggling about this...we like the BEACH one! The last photo of you two made my human LOL! So I told her how rude that was! 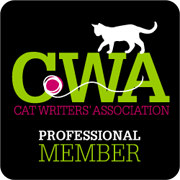 Don't enter us, of course - we have our own Trapacat (and giveaway)! Katie is there a lid to the Cattrap´s ?! We like the beach trap! 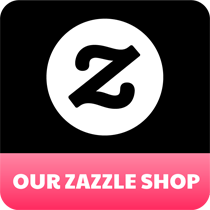 We now follow them on Fb & twitter. It looks like Gloman will referee! That jungle one is pretty cool...I'd like to trap Ernie in it for awhile...but it doesn't look big enough for his paws. We want the jungle theme. It is easier to hide in jungles. 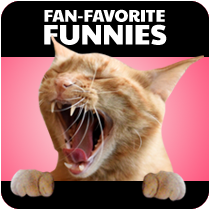 We likes everyone on FB and Twitter and we shared your giveaway on Twitter. We like the beach one! LOL what a clever idea! We love the beach one! Oh boy, that's cute! Katie, wait til the orange crush is sleeping, then get your turn! Laila would LOVE the boxing theme since she was named after Laila Ali, Mohammed's daughter. Our Laila is quite the boxer herself! Great giveaway! I liked on FB and I think my kitties would like the jungle one. That's cool! 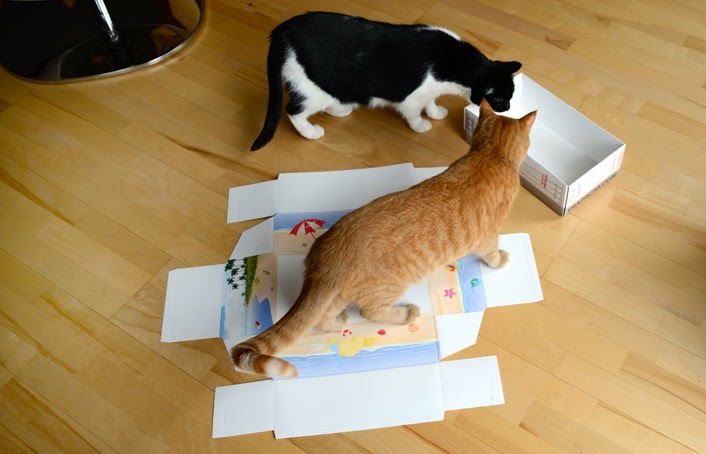 We love boxes :) We'd like the beach scene one if we happen to win. Jungle cat! I reminds me of grade school! - Alana. And also because I'm a tiger! - Crepes. Is it a separate comment if you already like you on facebook and twitter? I like you every where I go, Katie. Rocky spoke up and said he likes the boxer (he was named after the composer but turned out more like the fighter) but I insist - Jungle Theme. We love the beach one. Boxes are really cool. Hope we win. @pumpkinpuddy here. Those look like fun boxes. I'd love the jungle theme one. FaRADaY: Waff, dood. We think you shoulda done this post gangsta too! And gone 3 rounds with the Boss in the Ring! Maxwell: She's just sore that we're gonna ask for the Boxing Ring box. I wonder if it works like this, too? You guys are inneracting! 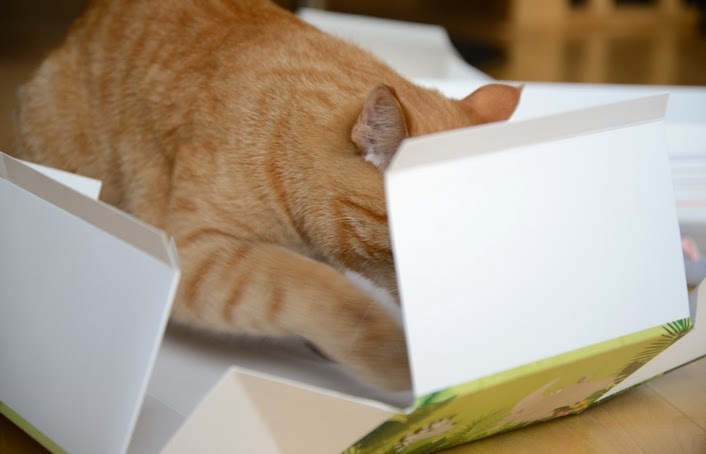 Over a fancy shoebox! It’s a fun idea & I wonder why no one thought of it before. Like I told Sparkle, you don’t have to enter me cos TW promised to make me one with Sharpies and glue. Heh heh! 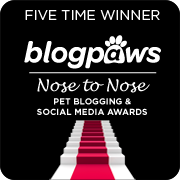 Would love to win a beach box! how cute. We like the beachy one. Glogirly using HBO words! Too funny!!! Katie, it's a trap!! Waffle wants to trap you so he can sniff you and kiss you! Run! Unless you like him now and we all know that you do! This is the coolest idea of the year! We would like the beach box! Hi guys! 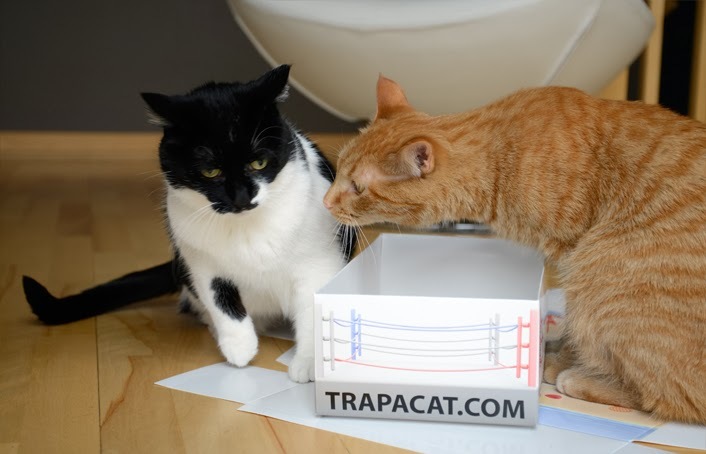 I finally managed to have a google account, I would love to win a trapacat with boxing ring to giveaway. I am so sorry that I couldn"t participate to your black friday contest especially when I saw your cool prizes in your today post. A lot a kisses for you, andra. With our 4 kitties the jungles is the best pick. 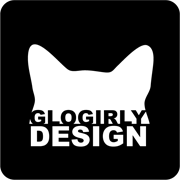 We follow Glogirly on Facebook. We follow trap at on twitter. We follow trapacat on Facebook. 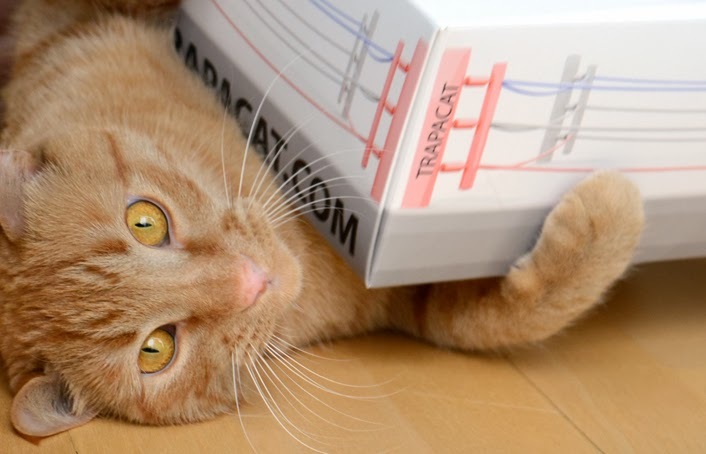 We follow Trapacat on Twitter, no matter what autocorrect tries to say. Of course I like the beach scene! Does Waffles come inside? 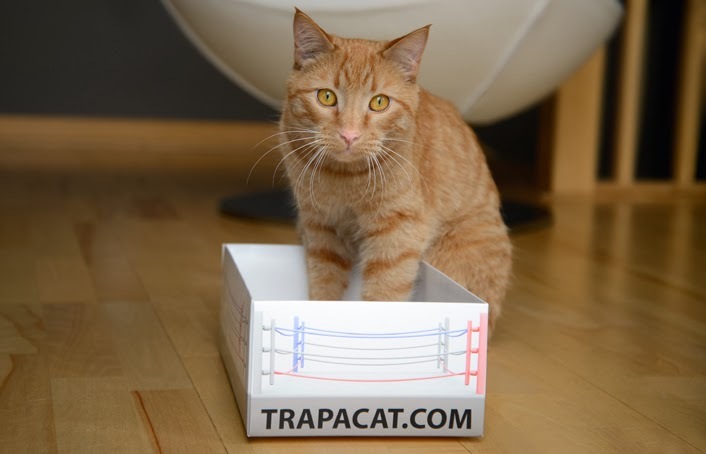 I would love to see my boy cat Puffy in the Boxing Ring trapacat! 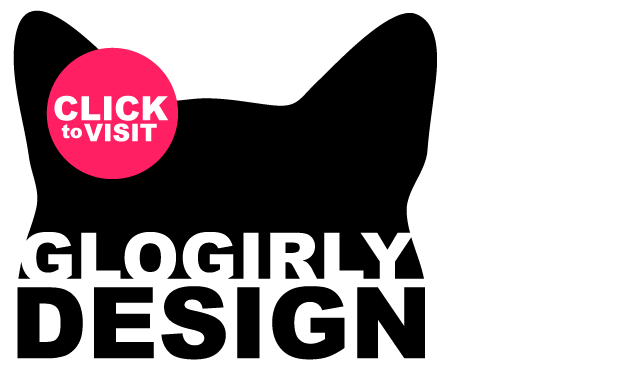 We follow You, We Follow THEM, we love you and love them... Oh yeah we like you on FB too. Cool idea. My cat is definitely jungle! Such a clever idea. We like the Jungle version!